Readers have a lot of options when it comes to tie-ins to Marvel’s big Secret Wars event, and it’s been a surprisingly strong assortment of titles. The books have varying degrees of connectivity to the main series, but the best tie-ins have creative teams that take advantage of the freedom of this new Marvel landscape to tell stories that don’t rely on larger Secret Wars knowledge. The first issue of The Infinity Gauntlet was a completely standalone story about a family trying to survive in a devastated urban environment overrun by giant killer bugs, telling a suspenseful narrative that was as compelling as it was beautiful. Co-written by Gerry Duggan and Dustin Weaver with art by Weaver, The Infinity Gauntlet stands out by downplaying the superhero elements and instead committing to the survival horror aspect of the story. The arrival of a new Nova suggests that the balance may be shifting in future issues, but ideally Duggan and Weaver will keep the focus on the struggle of this family. 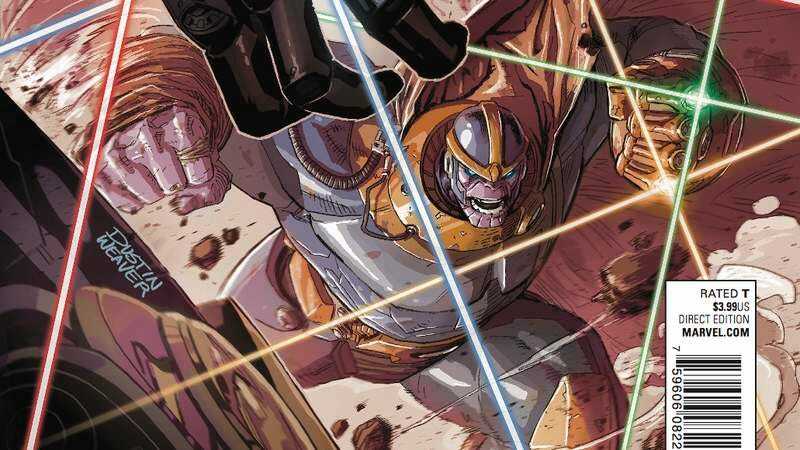 No matter how the story evolves, it’s going to look good with Weaver on art duties, and this preview of next week’s The Infinity Gauntlet #2 highlights the sense of scale he brings to this book. The detail he puts into the dystopian environment makes the family look especially small in the sprawl of this world, intensifying their uphill battle to stay alive. Having a Nova on their sides increases chances of survival, but with Thanos lurking in the background, danger is still very close by.